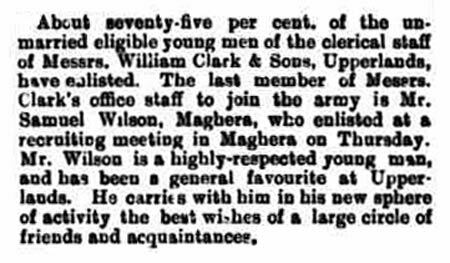 About seventy-five per cent of the unmarried eligible young men of the clerical staff of Messrs William Clark & Sons, Upperlands, have enlisted. The last member of Messrs Clark’s office staff to join the army is Mr Samuel Wilson, Maghera, who enlisted at a recruiting meeting in Maghera on Thursday. Mr Wilson is a highly respected young man, and has been a general favourite at Upperlands. He carries with him, in his new sphere of activity, the best wishes of a large circle of friends and acquaintances.